If there's one thing that you're likely to hear more than just about anything else throughout your life it's the statement that everyone needs to get out into the world and travel as much as possible. Of course, you might be the kind of person who loves travelling more than anything and gets out of the country at every opportunity. However, if you're the other kind of person, the one who would rather stay at home and doesn't really get what all of the fuss is about, you could well be missing out on some wonderful opportunities. The truth is that travelling really can be as wonderful as everyone says it is. With that in mind, here are just some of the reasons why you should take the chance to embrace travelling. It can be pretty tough to answer the question "who are you?" when it comes down to it. After all, we are all so heavily influenced by the world around us that there's no way that we could escape the context in which we were raised. The culture that you were brought up in is going to have a huge impact on the kind of person you are. Getting out into the world is a wonderful way of removing yourself from that context. That way you can really get to know yourself in a way that simply isn't possible when you spend your time somewhere familiar. Not only does travelling allow you to get to know yourself but it also lets you get to know other people too. After all, if you're getting away from everything that's familiar and ending up in a totally new place then you really have no choice but to throw yourself into that new culture and to get to know the people around you. Doing this not only helps you make new friends but it gives you a whole new perspective and reminds you that your little corner of the world isn't the only thing that matters. Of course, even if you're not that much of a people person, travelling helps you get to discover new places that you might never have encountered before. You might think that your hometown is the coolest, most fun place in the world but there's a pretty good chance that there's somewhere out there that will put it to shame. In fact, when you're travelling you may even find a place where you want to put down roots. From finding the perfect property for sale in Los Flamingos to discovering a love for the style of living in somewhere like Thailand. The only thing more freeing than visiting a new country is settling down there. The modern world is a busy one. Not only that but it can be incredibly crowded. It can often feel as though people are constantly around you, even when you're alone. After all, even if you're by yourself you've still got your phone, your computer, and all of your social media to keep you company. Getting away from all of that and visiting a new place can help to refresh you and get you back to yourself in a way that you might never be able to at home when you're surrounded by friends, family, and work. Experiences are more important than stuff! If there's one thing that gets in the way of a lot of people being able to travel as much as they would want, it's money. Travelling is not always cheap and that can get in the way. But that doesn't mean that you'll never get the chance to travel to new places. The truth is that cutting back on buying things to free up funds for travelling can be a great idea. The truth is that the memories of an amazing experience are almost always going to end up being more valuable to you than any junk that you fill your home with. Of course, the truth is that travel isn't necessarily going to be right for everyone. If you do discover that you're the kind of person who really is just happier staying at home instead of exploring the world, that's okay! However, the only way that you're ever going to be sure of that is if you get out there and give it a try. After all, most of the things that people come to regret are the chances that they didn't take. Of course, once you've been away from home you come to appreciate it a whole lot more since you know what being away from it is really like. 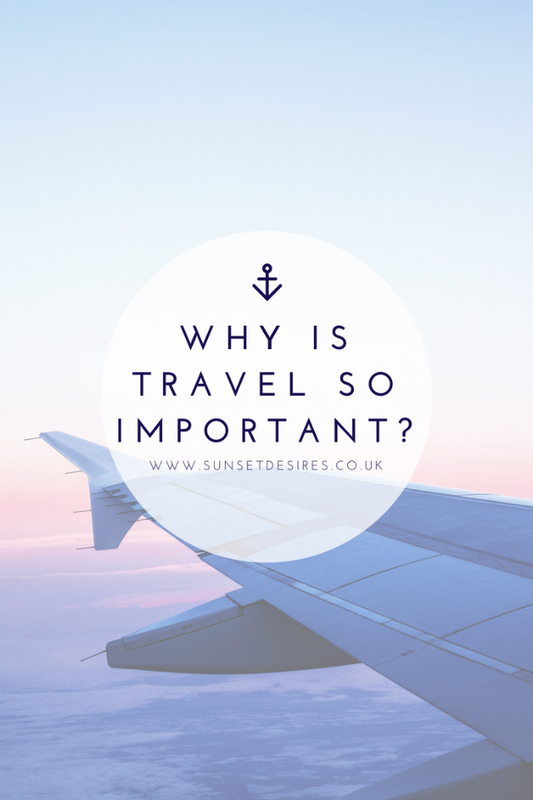 Why is travel important to you? Let me know in the comments below and then go and check out more travel-related content. That is definitely true. I love this! Make sure you have a beautiful weekend too. I totally agree, I'm trying to visit at least two new places every year! Oh that's awesome! I'm trying once a year at the moment and 2 years running have been successful!